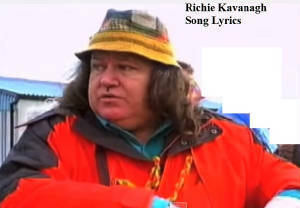 Richie Kavanagh Funny Irish Song Lyrics. Here's a bunch of my favourite song lyrics [ some have chords ] from Ireland's funny man of song, Richie Kavanagh. The bold Richie was born in Carlow in 1949 and still lives there. It wasn't until the late Gerry Ryan who was a D.J. Richie had been preforming his own songs on stage around Ireland for years before. It goes to show the power of radio play.